With the holidays fast approaching, many people are looking for ways to give back. The Children’s Center Rehabilitation Hospital makes it easy through the Holiday Helpers Gift Drive. The 12th annual event will kick off Thanksgiving Day and will run through New Year’s Day. 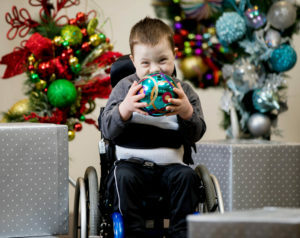 Shoppers may choose items from departmental wish lists or purchase Christmas presents for specific patients. Needs lists are also available online at registries for Target and Amazon. Items can be dropped off daily between 9 a.m. and 9 p.m. at The Children’s Center Rehabilitation Hospital’s main lobby inside the Donald W. Reynolds Complex between Thanksgiving and New Year’s. The Children’s Center Rehabilitation Hospital is located on N.W. 39th Expressway just east of Rockwell. For more information, please call (405) 789-6711 option 4.